For The Record: Healthcare 2010: What's in Store? Healthcare 2010: What’s in Store? Several of e-health’s leading thinkers offer their perspectives on what promises to be a landmark year in the industry. No one can predict the future—except for Oprah, maybe, but that’s beside the point. Despite our lack of forecasting skills, it’s always fun to use our experience to take an educated look forward to what’s coming down the road. To ascertain what may lie ahead in the health information field, For The Record (FTR) posed a series of questions to some of the industry’s brightest minds—with one exception. Sal Obfuscato, executive director of SEEDIE (the Society for Exorbitantly Expensive and Difficult to Implement EHRs), clearly is out of his league here, but he gives it his best shot. In all seriousness, although Obfuscato’s answers are tongue-in-cheek, like most satire, they contain elements of truth that others may want to ignore. The rest of the esteemed lineup features Deborah Kohn, principal of Dak Systems Consulting; Lorraine Fernandes, RHIA, senior vice president and healthcare ambassador for Initiate Systems; Carl Cottrell, vice president of product management at eWebHealth; Claudia Tessier, RHIA, president of the mHealth Initiative; Shelley Myers, RN, MS, CPHIMS, healthcare informatics specialist at User Centric; Jeff Margolis, chairman and CEO of TriZetto; and Glen Moy, a senior program officer at the California HealthCare Foundation. FTR: What topic/issue currently not making headlines will become big news in 2010? Kohn: HIPAA 5010 and ICD-10. Tessier: Participatory health enabled by mobile phones and other mobile devices will get increasing attention. Patients, providers, payers, and other healthcare stakeholders are no longer tethered to a PC or landline. Over 5,000 mobile apps are now available, and the number is rapidly increasing. Patients can be reminded of appointments and lab tests via text messaging and e-mails. They can research conditions and treatment through professional resources, as well as patient groups, often turning to the Internet for a second opinion. They can monitor their blood sugar, blood pressure, diet, exercise, and more with mobile apps. Disease management tools enable patients and providers to monitor chronic conditions not just at the time of office visits but routinely, even daily, with observations of daily living. Eligibility and sometimes even copays can be determined via cell phone. Web resources are readily available, allowing patients and providers to quickly identify potential drug interactions. Providers can consult ad hoc with online resources, as well as international colleagues. Public health monitoring can identify disease outbreaks and trends, as well as disasters, and communicate alerts to the public and to healthcare providers. Emergency providers can wirelessly record and forward patient data to the ED [emergency department] so that triage can begin before the patient arrives there. And so much more. Myers: HIT Extension Program grants, HIT usability—how to measure and improve, CCHIT [Certification Commission for Health Information Technology] incorporating usability evaluation into certification process—more physicians utilizing the CCR [Continuity of Care Record] and CCD [Continuity of Care Document] standards to share information electronically with their patients and other care providers, and patient/consumer empowerment … on the rise and working well. Fernandes: I believe data sharing (or data exchange) on a local/private/proprietary basis will gain greater visibility and focus. This type of data sharing is defined by the needs of a single healthcare enterprise to compete more effectively for the physicians in their service area or local community. It’s focused on providing a competitive advantage by creating physician affinity with the healthcare enterprise via orders and results sharing (either via EMR or fax machine) or by providing a longitudinal view through a clinical portal. It is likely to be driven by the competitiveness of the market, the volume of private practice physicians in the region, and existing brand loyalty. This data-sharing approach addresses coordinated care priorities like sharing referrals, orders, and lab and imaging results. There will be minimal conflict around the governance of sharing of information. And the value (return on investment) is probably far more tangible than regional, state, or national data sharing. After all, healthcare is largely local and remains competitive at that level. State initiatives clearly will receive high exposure since ONC [the Office of the National Coordinator for Health Information Technology] is releasing funding in the very near term, but I think the efforts toward serving the local community will accelerate. Cottrell: The importance of having an electronic legal health record (e-LHR) in addition to a clinical electronic health record because the e-LHR will meet the needs of the expanded HIPAA security rule. Under the expanded HIPAA security rule requirements (that take effect in February), covered entities will be faced with new rules regarding expanded accounting for disclosures, giving patients who pay for their own services the ability to restrict disclosure of their records upon request and providing records to patients electronically upon request. However, covered entities typically lack the IT infrastructure necessary to meet these new requirements. This is because EHRs are designed primarily for clinical use, not for fulfilling external record requests. The discussions regarding meaningful use have focused almost exclusively on the clinical EHR criteria and related health information exchange, not the administrative requirements which fall in the domain of the legal health record. It is vital that healthcare organizations understand the difference between the clinical EHR and the LHR—the record used to document and support billing, legal, and administrative processes. Insufficient e-LHR capabilities will result in cost implications in the form of potential HIPAA fines and penalties, as well as lost reimbursement opportunities under ARRA [the American Recovery and Reinvestment Act] funding programs when the EHR initiative fails to meet all criteria. Moy: One issue that has been overlooked is the capacity of ancillary providers (eg, clinical laboratories, pharmacies, etc) to support the increased demand for health information exchange as a result of meaningful use. For example, many hospital and reference laboratories will be inundated with requests from local small physician practices for interfaces in order to send lab orders and receive lab results electronically. However, most laboratories do not have the resources to implement numerous individual interfaces, and many hospital-based laboratory information systems are not designed to push lab results outside the walls of the hospital. As for pharmacies, there is an assumption that the majority of pharmacies are ready to receive and process electronic prescriptions. But at the local level, many pharmacies require retraining and changes to workflow in order to handle e-prescriptions. Margolis: Once the demonization of health plans—which appears politically necessary for healthcare legislation to pass—subsides, payer-based personal health records will begin to be understood as a complementary method of achieving rapid and cost-effective health information exchange across providers and among consumers and providers. The real cost of implementing and maintaining provider-based EHR solutions and the inherent change-management challenges of implementing software-based solutions will gain more exposure. Both types of records are positive contributions to fixing the state of healthcare. Obfuscato: Britney Spears has certainly been quiet. We expect to hear more from her in the coming year. Our research also indicates physician depression will hit an all-time high in 2010 as cash-strapped practices use hoped-for stimulus funds to purchase expensive, client-server EHR systems that transform clinicians from productive and cognitive practitioners of the medical arts into lumbering clerks who perform data-entry functions for the few patients they can see in a day. All in all, it looks to be a great year, especially for those who invest in pharma companies with significant SSRI market share. FTR: Will meaningful use become nothing more than a selling point for EHR vendors? Kohn: I really don’t know. Most of this topic is still so vague and uncertain. Tessier: The risk is strong that just that will happen, particularly with the difficulties encountered in developing a uniform, widely understood and accepted definition. Myers: Although sales for EHR vendors will increase, anything that we can do to get physicians to not only use EHRs but to use them in a way that will make a positive impact on patient outcomes, patient satisfaction with the care experience, and help to improve care coordination and guideline compliance for those with chronic disease. If there is nothing to light a fire under these physicians to get them to move more quickly on leveraging technology to improve care, it will take years and years … essentially until those who are opposed to technology retire. Fernandes: Simply computerizing healthcare records will not achieve the outlined priorities. EHRs are certainly important. However, there is nothing in place to prevent the creation of multiple EHRs for a single individual, added by the many organizations serving that patient. The same problems that arise from lack of visibility into medical history, like drug allergies, will persist. Duplicate testing will continue. Money will still be wasted. For America to get the kind of collaborative care we desperately need—where health providers deliver cost-effective, quality care—it will take more than simply creating EHRs. Unless we get EHRs on the road to reform through interoperability and data exchange, EHRs will only become a new road heading toward the bridge to nowhere. Margolis: Meaningful use is well intended to actually help raise the level of healthcare quality and reduce costs. For the next several years, however, EHR vendors will use the concept of becoming certified solutions under the meaningful use definition to drive revenue and act as intermediaries to deliver ARRA funds to physicians and hospitals as a financing mechanism to help sell their products and services. Moy: I think we are already seeing this with various vendors guaranteeing achievement of meaningful use. However, meaningful use is not a product feature like e-prescribing or decision support but the result of providers fully and effectively utilizing their EHRs for patient care. What will impact providers’ achievement of meaningful use will be the effectiveness of their implementation efforts and the support they receive along the way. Obfuscato: Meaningful use is far more than an EHR vendor selling point—it is now the raison d’etre for every EHR vendor with plans to deliver the inflated returns originally promised to their VCs [vendor contracts]. SEEDIE is recommending that its members view meaningful use as a magical monetary infusion pump and the fastest way to funnel ARRA funds into vendor coffers, with physicians serving as mere “stimulus check endorsers.” In fact, we are launching an initiative called “44 is the Floor,” which encourages EHR vendors to charge exactly $44,000 to implement their systems while providing vague assurances that meaningful use criteria can be met, with the tacit understanding that additional funds will be required for support, upgrades, and the actual demonstration of anything resembling meaningful use. 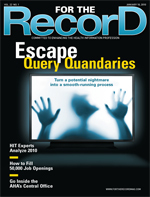 FTR: Will EHR implementation rates increase this year? Tessier: There will be increasing adoption this coming year, but it may take another year or two before the pace of that adoption actually increases. Conflicting and sometimes discouraging reports on the impact of EMRs, along with increasing concerns regarding costs and adoption difficulties, may well reinforce the “let’s wait and see” attitude, in turn further delaying increased adoption rates. Myers: 2009? No, they may actually decrease since everyone was and still is in a holding pattern for the final ARRA/meaningful use requirements. Once those are released and we get a few of the regional extension centers (RECs) up and running, we will see a surge in purchases and deployments. 2010 will be busy. Obfuscato: There is no question that EHR implementation rates will increase exponentially as EHR vendors employ inflammatory rhetoric designed to incite panic among physician practices. SEEDIE has developed a “Wait to Implement at Your Peril” education packet for vendor communication teams, with messages crafted by the same propaganda team that conceived the healthcare reform death panel rumor campaign and the successful direct TV marketing effort for Snuggies. In fact, our projections indicate that there will be more physicians with an EHR at the end of 2010 than Americans who watch TV wearing a blanket with arms. FTR: What roadblocks must be tackled this year to pave the way for more electronic health information exchange (HIE)? Fernandes: Duplicate records must be matched, linked, and resolved to create a single, accurate view of the health history of the individual. That “view” needs to be within reach of the treating healthcare professional. That single, accurate view must bridge the continuum of care. Margolis: I believe that HIE is the most hoped for and least understood concept in popular print. The fundamental roadblocks to achieving an effective health information exchange are the concepts of aggregation and governance. The point here is that other than in integrated delivery systems, providers are not natural aggregators of populations of lives. So while it may seem second nature that one or two dominant market-share providers in a given geography are natural governance coordinators for that region, this becomes more complex as you get into areas with more distributed providers. This would be an appropriate time to mention that over 80% of insured lives are already aggregated by less than 20 health plans. Between health plans and CMS, you have natural aggregation of the population. While states work to figure out the HIE governance structures, leveraging the aggregation that already exists should be carefully considered. Moy: One obvious obstacle is the lack of policies, procedures, and mechanisms for managing patient privacy preferences and release of patient health information to designated providers (including the ancillary providers mentioned above). A related roadblock is the range of messaging standards themselves, that is, the specifics of how information is sent and shared. While progress has been made, setting up the ability to share information remains time and effort intensive. And the standards do not fully account for unique aspects of small primary care practices. The California HealthCare Foundation has tried to help overcome some of these obstacles by developing ELINCS (EHR-Lab Interoperability and Connectivity Specification), which standardizes the formatting and coding of electronic messages exchanged between clinical laboratories and ambulatory EHR systems. But there is still much to be done before health information exchange is seamless and ubiquitous. FTR: Will there be a job explosion in the HIT industry? If so, how will it be filled? Kohn: I don’t know if we’ll see this, per se, in 2010. But there is no question that HIT jobs will be badly needed beginning in 2011 to 2015 for sure. I just received a notice to attend an important meeting for a REC committee even though the RECs still are not defined. The community colleges are full of hopeful HIT students, but that never guarantees quality and volume. Tessier: I doubt it, at least not for some time. The economy will have to recover first, and education and training will be necessary, potentially creating a lag between job availability and qualified people to fill those jobs. Myers: Yes, there already is. We will need folks who can implement systems, conduct user research and usability testing, work with physicians on planning for ARRA/meaningful use, integration work for HIEs, etc. I’m not sure how it will be filled. My guess is that folks (technical and strategic) from other industries will be pulled over and will need to learn healthcare. I hope that we do not see a large surge in people leaving the practice setting (hospitals/clinics) to go work for vendors and consultants. We need those people to stay and will need to pull people in from other industries (grow the workforce vs. shifting around). Margolis: Yes and no. There will be a “job shift” of integration consultants, project managers, software developers, and support professionals from other vertical markets to the HIT sector. This has already been occurring and will accelerate. People have to remember that HIT means much more than EHRs and includes health plans, analytical solutions, and even administrative solutions for physicians and hospitals. Nonetheless, you will see EHR job training programs in technical trade school and colleges crop up in a viral manner to try and fill technical and functional positions. Over time, the implementation of higher automation is at least partially meant to increase work efficiency, which means that manual and technology-light supported jobs will be partially replaced by automation. FTR: Will the economy still be a major concern for healthcare organizations? Kohn: Yes. It will improve but slowly. Tessier: The economy will continue to be a major concern, perhaps more so than ever, particularly with healthcare reform being stalled and potentially deformed rather than reformed. Indeed, some predict the next big crash will be in the healthcare industry. Margolis: Less so than most other sectors. There is going to initially be more money piling into the sector that will provide some level of courage to make investments. As we look several years out, however, the need to produce greater value for each healthcare dollar spent will place enormous pressure on healthcare entities of all types. This will be less a function of the economy and more a function that current value for healthcare is not good. Obfuscato: At SEEDIE, our lobbying efforts are aimed at passing a comprehensive healthcare reform bill that will increase medical costs. Healthcare is a significant part of our economy, and we believe that reducing medical spending would have disastrous effects. Instead, we hope to inflate healthcare spending until it is 50% or more of our national economy. We envision disposable income being invested in three industry sectors: snack foods, television programming, and medical care. Americans will spend what little discretionary income they have on chips, ice cream, soda, and cable television. This sedentary, high-calorie existence will increase the need for medical treatment—the kind of therapies that will require significant postprocedure rest and recuperation. This virtuous circle will fuel a new economy. FTR: What steps need to be taken to get consumers more involved in their own care? Kohn: This was the key issue at the recent Health 2.0 Conference in San Francisco. The good news is that consumers are becoming more involved in their own care (via the Internet, etc). The bad news is that consumers are still slow to adopt PHRs [personal health records] or technologies that increase their involvement in care because of poor marketing, new systems, poor functionality, etc. Tessier: Make information and resources readily available. Respond to patient needs and preferences for easy, clear communication. Remove the financial barriers that patients encounter in getting their own information and guide them toward resources that help them understand their health and conditions. Involve patients in the documentation process and encourage/facilitate their adoption of PHRs and CCRs. Mobile devices will play a huge role in promoting and supporting consumer involvement or, as noted above, participatory health. Myers: Health coaches, more “skin in the game” so they value their care and are motivated to comply with guidelines and recommendations, sharing of data—electronically, via paper, via in-person communications with their physicians. There are a lot of tools available to consumers/patients to manage or learn about their health, but some are not all that usable. Many of the patients who would benefit the most (eg, older patients, those with chronic diseases, rural) are oftentimes the ones who have the most difficulty using these systems. More user research should be conducted to find out where the gaps are and if the tools, devices, Web sites are adding value or might pose safety risks if not used properly. Margolis: Value-based benefits will be a key to increased consumer involvement. Value-based benefits are designs that encourage use of proper care and discourage use of inappropriate/preference sensitive care. The incentives are economic, such as reducing copays or deductibles, for actively following a recommended health improvement plan. You will see such benefit designs increase in 2010 and grow rapidly over the next several years. Ideally, there will be a parallel set of incentives for providers who will actively communicate, using information technology, with consumers. Obfuscato: We at SEEDIE advocate a new initiative called Medical Homelessness, an alternative to the Medical Home movement. Medical Homelessness pays lip service to consumer involvement and will require significant grant funding for poorly defined and executed pilot projects but will not actually engage consumers in any meaningful way. Medical Homelessness is designed to preserve the status quo, making absolutely certain that patients are confused about where to turn for medical help. Our program is designed to counteract the impact of the medical home, which could have a negative domino effect. Imagine a slightly obese, borderline diabetic who works closely with a health coach or advocate and learns about his or her risks and makes lifestyle changes and then monitors his health using a PHR. Instead of adding to healthcare costs as a percent of our GDP [gross domestic product], this patient could actually lose weight and avoid diabetes and its potentially lucrative comorbidities. Medical Homelessness will disrupt any attempts at care coordination and encourage consumers to simply feign compliance with care directives. FTR: Are there any new technologies that could make a dent in improving HIE? Kohn: One must be careful to define HIE. HIE can be local, interorganizational, or it can be regional/national, intraorganizational. The Internet isn’t a new technology, but it’s the best technology out there for HIE on any level. Tessier: Mobile communications will help here, too, enabling access to, as well as recording and transmission of, patient information by anyone (authorized), anywhere, anytime. Mobile devices and mobile apps can achieve the communication and interoperability capabilities long sought after by patients, providers, and other stakeholders and promised but not yet fulfilled by the EMR industry. Margolis: Yes, payer-based personal health records. Nearly 100% of claims data is already digitized. This data includes diagnoses, procedures, date of service, place of service, treating physician, and pharmacy history (to name a few data items). This is a very rich set of data that is complementary to HIE efforts. I believe a payer-based approach could provide an HIE framework for about 1/20th of the cost of building it up from a provider perspective. Obfuscato: As everyone knows, health information exchange is not a technical challenge—it is a political one. Organizations like SEEDIE exist to erect barriers—information fortresses that protect the proprietary interests of our EHR vendor community. To forestall the trampling feet of interoperability in our walled gardens, SEEDIE has developed a new weapon called the inertia saber. In the coming year, we intend to send jack-booted storm troopers to meetings where there are discussions of topics such as “standards harmonization” or “exchanging discrete data elements.” These SEEDIE soldiers of fortune will deploy their inertia sabers, deftly convincing meeting attendees that true interoperability is a quixotic pipe dream that deserves endless discussion but is not worthy of any concrete action.